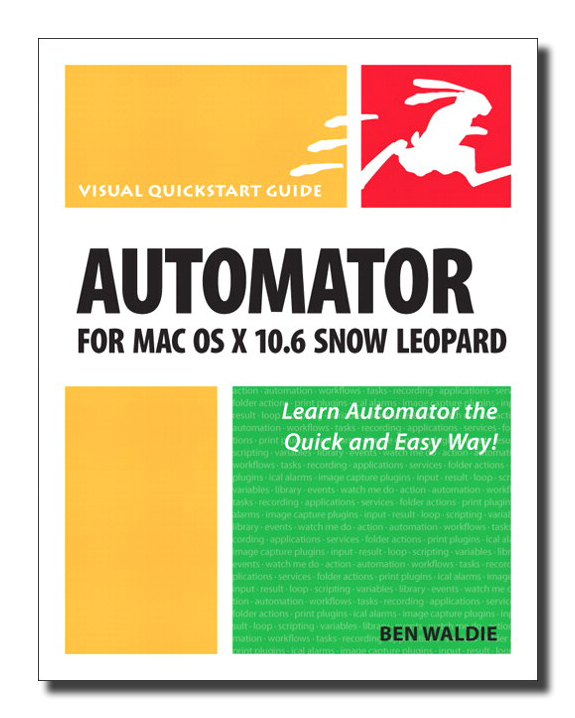 This book uses a combination of task-based instruction and strong visuals to teach intermediate Macintosh users how to automate repetitive, time-consuming tasks with the Automator application that is included with Mac OS X 10.6 Snow Leopard. Automator comes with many useful automated routines (called actions) preinstalled, for lots of popular applications, that do things like remove empty playlists from iTunes or add attachments to Mac Mail. The real power of Automator lies in mixing and matching these actions to have them do exactly the job you want. They're put together in a string of actions known as a workflow. Author Ben Waldie introduces readers to how Automator works, and then helps them assemble and use Automator workflows. Both beginning users who want a thorough introduction to Automator and more advanced users looking for a convenient reference will find what they need here in straightforward language, clear steps, and practical tips. Available from Peachpit Press, Amazon.com, and other fine book sellers. 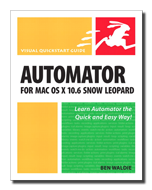 Automator for Mac OS X 10.5 Leopard: Visual QuickStart Guide uses a combination of task-based instruction and strong visuals to teach Macintosh users how to automate repetitive, time-consuming tasks with the Automator application that is included with Mac OS X 10.5 Leopard. Automator comes with many useful actions for lots of popular Apple applications. Each action performs a single specific task, such as removing an empty playlist from iTunes, or adding attachments to a Mail message. The real power of Automator lies in mixing and matching these actions to perform exactly the job you need them to, in a string of actions known as a workflow. Author Ben Waldie introduces readers to how Automator works, and then helps them assemble and use Automator workflows. 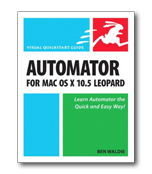 This book covers the major updates to Automator that are part of Mac OS X 10.5 (Leopard), including a variety of highly anticipated features, such as recording, looping, and the use of variables within workflows. 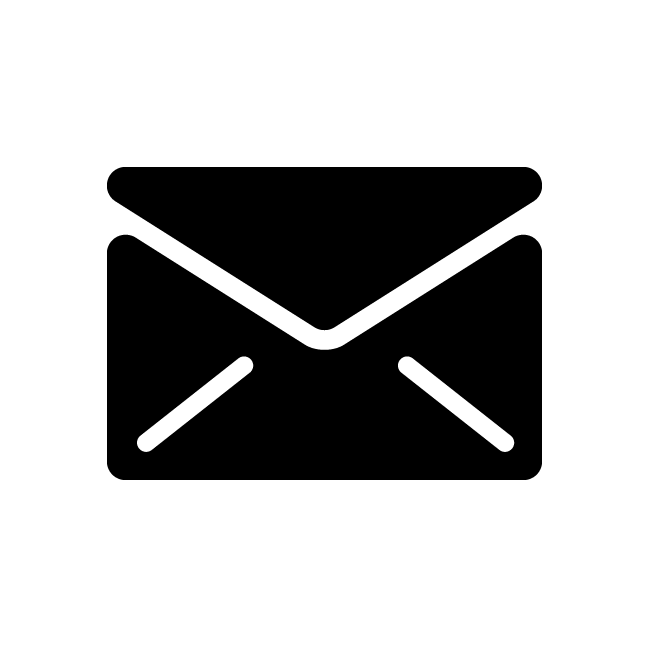 These features make Automator more flexible and powerful than before, greatly increasing its appeal and interest to any Mac user looking to become more efficient.